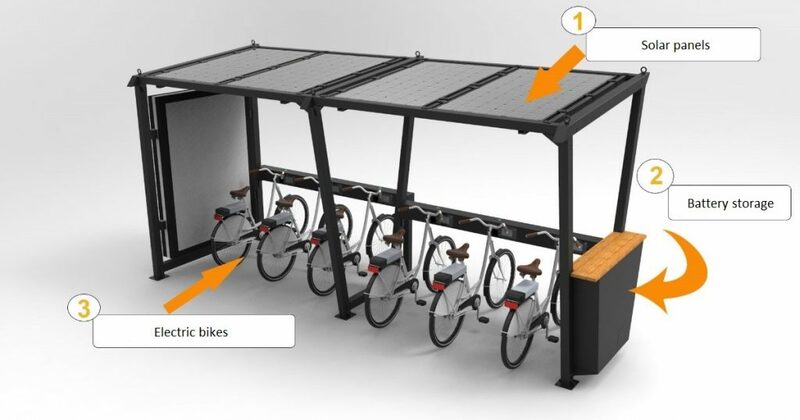 For the need to house the bicycles and their protection from weather conditions, EasyBike system features specially constructed bicycle covers to protect bikes in the best possible way and also be integrated harmoniously in the installation area and its surroundings. The covers are elegant constructions specially designed for bicycle stations. Available in different dimensions and adapted to the requirements of every bicycle locking point. If required, there is an available version of covers with electric autonomy. That means that the covers can provide electric autonomy to stations and electric bicycles. Their construction is special and via integrated photo voltaic system on the roof and energy storage can provide the energy which required. More specifically, on the roof of the covers can be installed photo voltaic panels and wiring through the fixed portions of the roof ends in a special place where stored batteries and accumulators. Thus by appropriate routing of the wiring, power is provided to the stations and to the electric bicycles when they are stationed in their bases.